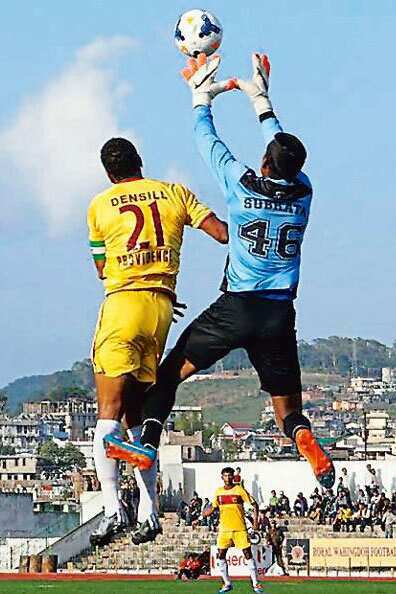 This is the story of a club that entered the third division of the Shillong Premier League, four tiers below the top of Indian football’s pyramid, in 2007. Eight years later, they made it to the I-League, and remarkably, finished third in their debut season. This club also made the cut for the elusive but necessary All India Football Federation (Aiff) I-League club licence. That season, the club saw an average attendance of around 10,000 at their home ground, which is bang in the middle of Shillong; their stadium saw a full house even when there was a hailstorm during a derby match. Compare that to the average attendance when clubs in Goa, where football rules, were playing at home: an embarrassing 140. The club we are talking about, Royal Wahingdoh, played the 2015 I-League season with an average of eight home-grown players out of 11. Their Under-18 (U-18) team is not only unbeaten in the U-18 I-League so far, but is yet to even concede a goal. Wahingdoh also provided a rich supply line of players when the Indian Super League (ISL) rolled in; the likes of Jackichand Singh (FC Pune City), Seityasen Singh and Reagan Singh (NorthEast United), Lalchhawnkima (Atlético de Kolkata) and Sena Ralte (Chennaiyin FC), among others. From every angle, this was a footballing fairy tale. Then, on 19 November, Wahingdoh pulled out of the I-League. The decision has reduced the I-League to nine teams, just one more than the ISL. The other two clubs to shut down first-team operations are Pune FC and Bharat FC. The soft sound of the shuffling of papers as these three confirmed their pullout was in fact as loud as the clang of a guillotine falling on the I-League’s neck. Of the three, Wahingdoh’s case is the most curious. Apart from monetary issues, they had, or rather have, everything that a football club in India needs to survive: a superbly located stadium, fans who religiously attend games, a team which has undeniable talent and gets results, an Aiff licence, a youth academy, a hostel for the players, scouting depth, and a brilliant manager. They even sold 90% of their club jerseys. Ideal. Why did the club quit the I-League, whose new season begins this Saturday? It points to something that the fan who swoons in the hopeless romance of Indian club football cannot accept. Something that is there for all to see, but still unacceptable to many. This points, in a nutshell, to the abject failure of the I-League as a marketable product, and proves that its unsustainability can have an impact on even the most sustainable of clubs. Marketing for the ISL starts around a month before the tournament kicks off in October. Hoardings abound in every city, every major newspaper has ads, and Star’s eight sports channels are full of ISL glitz. The I-League, on the other hand, is almost invisible. Every year, it starts at some point—hoping to become a memory—and ends up being witnessed by few, remembered by fewer and fading from the brain quicker than a Justin Bieber song. “When you got the eyeballs that Star Sports can give you as a partner company of the ISL, there is no way in hell that the numbers are going to work in my favour," says Dominic Sutnga, managing director of Wahingdoh. “My offering is a ghost-in, ghost-out competitor. We went to companies for investment and they said “Daan mein ₹ 30 lakh de sakte hain (we can give you ₹ 30 lakh as charity)." The 39-year-old took over the management of the club in 2008 and oversaw its rise from wilderness to I-League football in a mere eight years. He lived the dream and believes that to one day live it again, he needs to take a break. “Every year, the expenses increase. I cannot provide the eyeballs and I cannot provide my players that sort of salary (like the ISL)," he says. “If I need to matter in the football world today, either I continue to bleed to survive or take a breather and return once Indian football has sorted out its problems." The I-League has been hounded by its lack of visibility ever since its inception in 2007 (and even earlier, when it started life in 1996 as the National Football League). The ISL, an aggressively packaged product by Star, backed by the powerhouse IMG-Reliance, with phenomenal recall value for its international band of yesteryear stars, has just dug the knife deeper into the I-League. How can a league of largely unknown players, playing to empty stadiums, compete with one which has names like Roberto Carlos, Florent Malouda, John Arne Riise, Robert Pirès, Lúcio, Elano, Hélder Postiga, Nicolas Anelka and Zico sees average attendance of thousands and is beamed over eight channels? “There was viewership interest in football for the (English) Premier League and other European leagues," says Puma India managing director Abhishek Ganguly. Puma sponsors the ISL match balls, and kits for three out of eight teams. For Wahingdoh, which operated on a budget of ₹ 6-7 crore in their only I-League season, it was about making a tough choice. “We thought about it this way: Should we pump in more money into playing in a league where we got no recognition and no visibility or put the same money into building infrastructure, scouting for more talent and making sure we are ready to come back stronger than ever?" says Rajas Joshi, who heads Wahingdoh’s development and marketing department. Aiff president Praful Patel can accept Pune FC and Wahingdoh pulling out, but on the one-year-old Bharat FC, he said during a match in Mumbai in December: “They (Kalyani Group), owners of Bharat FC, have done a great disservice to Indian football." Ask the clubs, and they will blame the federation for ruining Indian football by letting the cut-throat business of a franchise-based league, the ISL, tarnish the sport. Go to the federation, and they will point the finger at clubs for failing to market themselves. According to Sunil Chhetri, India’s captain, the solution is simple: “Call it what you want, but India needs one unified league." In August, India head coach Stephen Constantine met me in Pune at a national camp. He didn’t mince words when I asked him who was to blame for the roadblocks when it came to planning for this unified league: He blamed the two giant Kolkata clubs, which have opposed such a move. “Mohun Bagan and East Bengal are huge traditionally but what have they done for Indian football lately? It’s 2015, you either move on or you die. If the Bagans of the world cannot step up, then they will fall behind. But you cannot hold the whole country back for one or two or three clubs who don’t want to change," he said. Then there are the finances: Aiff pays I-League clubs ₹ 40 lakh for travel and accommodation expenses every season, but there is no trickle-down from the broadcast revenue. None of Aiff’s broadcast deals are made public. In fact, more than one source told me that the federation had to pay channels to show matches. The world’s top leagues run on broadcast money. For example, the English Football Association does not pay its clubs money to travel and live; but the billions of pounds that Sky, BT Sport and ITV pay them for rights to show matches is what makes the Premier League so lucrative. For that matter, broadcast revenue is not shared among ISL clubs either. But there’s a central sponsorship pool—IMG-Reliance and Star use 20% of this money to organize the league. The remaining money is distributed among the clubs (the pool money for the 2015 season was ₹ 100 crore). ISL clubs face an operating cost of around ₹ 30 crore every season; and when the franchise forms were being distributed, interested parties were clearly told not to expect any returns for at least a decade. But Bollywood stars like Ranbir Kapoor, Abhishek Bachchan and Hrithik Roshan, cricketers like Sachin Tendulkar, M.S. Dhoni and Virat Kohli, and companies like the Dempos and Muthoot Finance are ready to take this hit, because they know the ISL guarantees visibility over three months. And for a sport to inspire, it needs to be seen. “It’s sad, it’s shocking too, imagine yourself telling a group of players that we won’t be playing in the I-League. This, after years of striving to get there," says Sutnga. It’s not just about marketing and investments and television rights. This is about professional sportspersons losing their jobs. Three clubs pulling out means a minimum of 75 first-team players without a team. “The players who don’t have enough I-League experience and didn’t play the ISL will find it difficult. Two more clubs (apart from Wahingdoh) pulled out so there are more players out there looking for a team. It’ll be a huge challenge," says Jackichand, who went for ₹ 45 lakh to FC Pune City. Most of the other clubs in the I-League, including Goan giant Salgaocar and the two Kolkata clubs, are on a shaky footing as well: Attendance is dismal, finances are in a poor state, and sometimes even player salaries are not paid. But is ISL really the way forward? There are many uncertainties in football, but the one certainty, across the world, is that the sport needs a strong year-long league in any country to survive and develop. “Visibility, while necessary, is not equal to development," says Wahingdoh’s Joshi. ISL clubs are putting effort into developing football at the grass-root level but most of this is rubbished as PR activity. For the traditionalist, the ISL is a capitalistic monster fooling fans. The players are divided too: “Which is better, that I don’t know…but in the ISL, we can train under international coaches and share dressing rooms with world- class players. It’s new and a great experience, but when I started playing football, the dream was I-League. For the sake of players and clubs, India needs a longer league," says Seityasen. Seityasen did brilliantly for the NorthEast United in ISL 2015. In an interaction before the ISL 2015 final, I had asked Brazilian legend Zico whether the tournament has to look at expanding across eight months, like a regular football season. “If you want it to be a show and for entertainment, then a two- to three- month-long ISL works. But if you want to develop Indian football, you need the league to be eight months long at least. Only then will the pressure to get results every few days reduce, and development of Indian football can take place," he responded. But Aiff is running out of options. Replacing the National Football League with the I-League in 2007 didn’t help. Running two leagues with separate teams won’t help either. Ingesting I-League clubs into the ISL seems the only viable option, the last ray of hope. A Mohun Bagan representative told me that the club plays for the history and legacy of Indian football. Well, you can’t pay players with history. You need to pay them money, and to make money, you need the ISL. The ISL’s biggest positive is that those wanting to make football a career can look forward to getting paid. During ISL 2014, I-League clubs were in the position to deny ISL clubs their players—Bengaluru’s stars, including Chhetri, didn’t play in the ISL. But such is the attraction of the money-spinning tournament that Chhetri is now on a full-time contract with Mumbai City FC and is being loaned back to Bengaluru for this year’s I-League. That is some power shift. But for the ISL to really flourish, it needs Fifa clearance, it needs a licensing system, and it needs to be longer. The other challenge is to convince foreign stars to stay for six-eight months in a country which isn’t really conducive to football. Aiff is at a crossroads. Its next step will define India’s football future.